(Bloomberg) -- It took an upheaval in the currency to shift the Turkish central bank’s focus away from inflation. With annual price growth stalling at just under 20 percent, it may not dictate policy again until calm returns to financial markets roiled last week by close-fought municipal elections. Data on Wednesday showed annual inflation at 19.71 percent in March, little changed from February. The final stretch before Sunday’s elections has tripped up a central bank that was on course to cut interest rates in the coming months as inflation stabilized. The lira went on a roller coaster ride starting from March 22 after a surprise drop in Turkey’s international reserves prompted speculation that policy makers were supporting the currency. The central bank responded by raising borrowing costs with a suspension of its one-week repo auctions. Days later, limits designed to tame short-selling through offshore funding markets kicked in, propelling swap rates beyond 1,000 percent and trapping investors in their lira bets. The lack of improvement in the inflation data “confirms our cautious call for policy easing later in the year, especially in the wake of market nervousness over fluctuations in the central bank’s reserves.” Carla Slim, an economist for Standard Chartered Plc in Dubai, said before the data release. 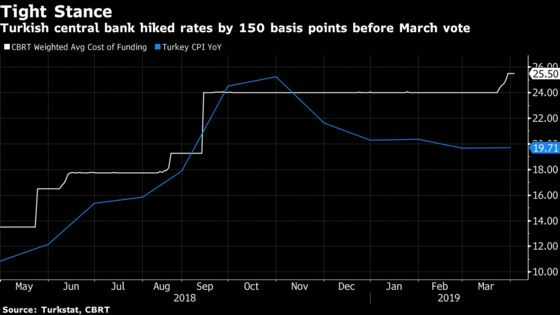 Although Turkey has slipped into recession, domestic price pressures remain strong, with inflation still almost quadruple the official target. Increases in the cost of fuel and medicines in March may also be offsetting efforts to contain food inflation.